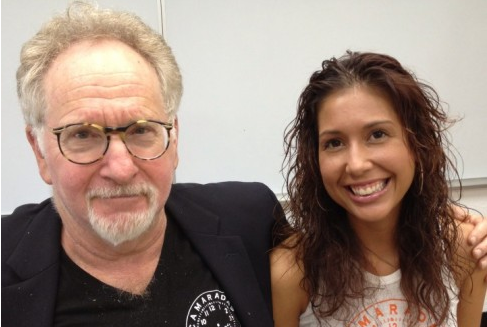 Castillo-Garsow with her mentor and co-author, Mark Naison. If you’ve ever walked around an urban neighborhood in a major city, you may have noticed them being sold on tables set up on the streets. They are slim novels, and usually depict people in the cover art. They are urban fiction books. Also found in bodegas, urban fiction (also known as street lit) is one of literature’s fast-growing genres. I recently got a chance to interview New York’s Melissa Castillo-Garsow, a Mexican-American author and Yale doctoral student. Her first street lit novel, Pure Bronx, which she co-wrote with her mentor, Fordham University professor Mark Naison, is set in the Boogie Down. Read my interview with Castillo-Garsow, in which she gives her thoughts on the origin of the book, but also about health and fitness (the story appeared on the Latino-centric health and wellness website, Vida Vibrante), here. But, below, she talks to me about the characters of Pure Bronx, Khalil and Rasheeda, a young couple from the South Bronx, trying to make it out of the ghetto and have a taste of the prosperity middle class Americans take for granted. Gina Vergel: Dr. Naison mentioned (in an interview with the student newspaper, The Ram) that the story has a social justice aspect. Why did you two include such an aspect in this story? Melissa Castillo-Garsow: Social justice for me is something that has always been a major part of my life. I originally did not like English or writing classes- the stories and main characters (mostly white male) never resonated with me and neither did classical language like that of Shakespeare. I was a good student, but I struggled a lot and didn’t enjoy reading very much. I first began to write because I proposed a column for the high school newspaper about human rights. I was a member of Amnesty International (one of two or three at my school) and was deeply concerned that people my age did know about what was happening in the world. Since then, everything I do has must have some sort of social justice aspect – I wouldn’t consider it worthy of my time, otherwise. Art for Arts sake is just not how I function. Art, writing, even academia (in the model of someone like Gloria Anzaldua) should invoke thought and emotion. What many of the Street Lit books lacked, Dr. Naison and I found, was that aspect of social commentary. They often ended very tragically through the trope of the inevitable result of ghetto life, or overly glamorized monetary aspects of “the Life.” We wanted to provide an alternative narrative – that involvement in illegal or unsavory activities does not define you. Other possibilities are available and fulfilling, especially if you commit to social justice and your community. GV: What can you tell me about Rasheeda’s character? MC-G: Rasheeda is definitely a strong female character. Raised in poverty, she is committed to bettering herself through high education, even when every aspect of her life provides her with other models or tells her its not possible. She overcomes many traumatic experiences without the guidance of a father or mother while assuming responsibility for her younger brother. I loved living with Rasheeda for the years we worked on this. She is so determined, strong and confident. But she is also sassy and fun. She is the one the keeps Khalil in check. GV: Since the story is set in the Bronx, an area teeming with Latinos these days, how much do they come into play in the story? MC-G: Latinos are an important part of the story because they are a vital part of the Bronx. Like many African Americans, two of Rasheeda’s closest friends are Puerto Rican and there are also Mexican and Honduran characters. Khalil also understands Spanish from having grown up in projects with Puerto Ricans and other Latinos as well. At the same time we don’t glamorize relations in the Bronx – some of the African American – Latino relationships are friendship, others are antagonistic. But you will definitely find español in Pure Bronx!! GV: You’re a doctoral student. What will your dissertation be on? What do you hope to do with your Ph.D? Teach? Any plans to continue with Street Lit? MC-G: My dissertation is going to be on Afro-Latinos in 1920s and 1930s New York City. Afro-descended Latinos in this country are a completely understudied and diverse group in this country, especially in this time period. And yet, it was such a vibrant, artistic and important time in African American history. I want to uncover how Latinos (who because of their appearance and segregation were in very close quarters with African Americans) were relating or not relating to black culture and politics. I do hope to teach, specifically Latino Literature and History, and perhaps some creative writing. Maybe more street lit? I’m not sure. We do have a sequel to Pure Bronx in mind. I guess it just depends on if there’s interest! Read more about Melissa Castillo-Garsow on her website.